I am always looking for books about cutesy animals, because there is an obsession for these kinds of books with the younger readers. When I saw that Cynthia Lord, a solid youth writer, had an animal book coming out, I couldn’t wait to read it. 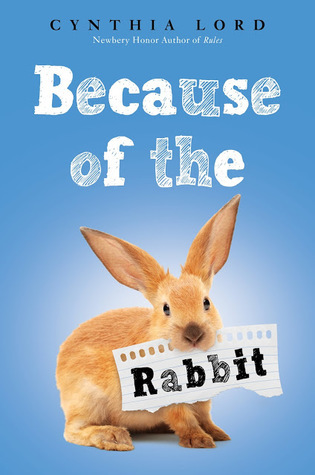 This adorable book with connect to readers for many different reasons. I received an eARC of it through Edelweiss in exchange for an honest review. Emma has always been home-schooled, which makes it easier for her to explore things at her own pace and learn about science in nature. Her father is a local game warden, so Emma and her family have been able to go along on different animal rescues and nurture many animals back to health. Emma was sad when her brother decided to attend the local school, because she doesn’t see him as much. Now she has decided to follow in his footsteps and begin attending the local school. The night before she starts school, Emma goes with her father on a routine animal call and helps him rescue a rabbit. The family then takes the rabbit in, until an owner can be found. Emma’s nervousness and excitement are kept in check because she is excited to take care of her new bunny. Making new friends seems to be a bigger challenge than she thought, so she hopes that her new pet will make it easier for her to find some new friends. This was a sweet story about an animal, but it also addresses other more important and relevant issues for readers. Any reader starting at a new school or transitioning from one type of school to another will be able to connect with Emma. Also one of Emma’s first friends at school has what appears to be a form of autism, or a learning disability. Even though many of the kids in her class avoid this student because he is “weird,” Emma quickly befriends him and shows that he is just as great of a friend as anyone else in the class. This book has wide appeal and is important for many readers.